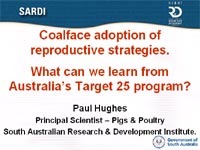 You can now view and hear a specially recorded presentation from Australian pig expert Professor Paul Hughes. He reveals common mistakes in breeding herd management, drawing on the experience of the Target 25 project in Australia. And, if you have any questions for Paul, please use the comments box below or email them to kt@bpex.ahdb.org.ukbefore Friday 6 July. BPEX will then forward them to Paul and make his responses available online afterwards.